From time to time I like to make a note of new postage stamps which are likely to be of interest to collectors with a Fortean inclination. 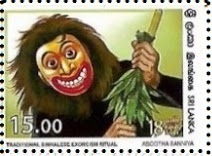 A new folklore-themed set from Sri Lanka shows characters called sanni, who are masked dancers in the role of exorcists. Instead of exorcising ghosts, these rather frightening figures are meant to chase off particular illnesses and ailments. There are eighteen different dances, which each represent a specific illness. The masked dancers who perform them feature in rituals to call the demons who are thought to affect the patient, and who are then told not to trouble humans and are banished. Now the NHS is no longer funding homeopathy, they might care to take a look at this technique, which is likely to be just as effective. There are eighteen stamps in the set, each depicting one of the traditional figures, and I illustrate some of the more cheerful, but nevertheless fearsome-looking dancers.